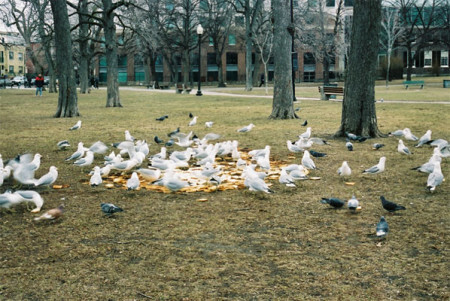 I wanted to involve unwitting collaborators in a performance, and decided that it would be the thousands of birds that hung out in the park near where I lived. I thought they’d appreciate a party. Who doesn’t love a party? 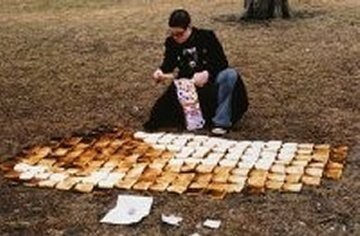 I know that birds like bread, and thought it would be funny to have them eat their own effigy. 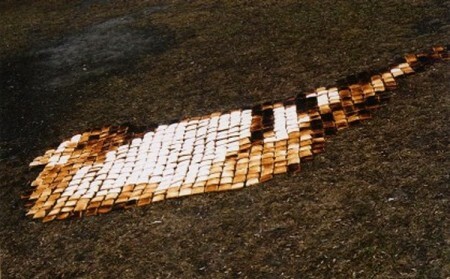 I made a pixellated picture of a pigeon out of 538 precisely toasted pieces of bread, by dividing the tonal values of a pixellated picture into six tonal zones, counting them up and toasting accordingly. 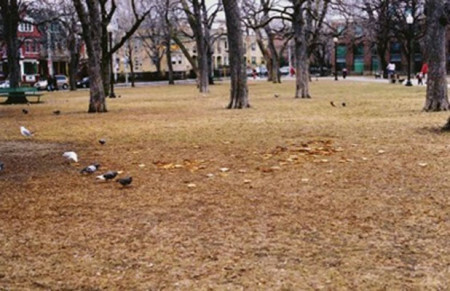 I went to the park on a Saturday afternoon and laid out the giant toast pigeon. The trees around me creaked with the weight of hundreds of birds who watched me silently. When I was done they didn’t move. Eventually some landed on the ground to investigate but wouldn’t go near the toast, clearly not used to this. 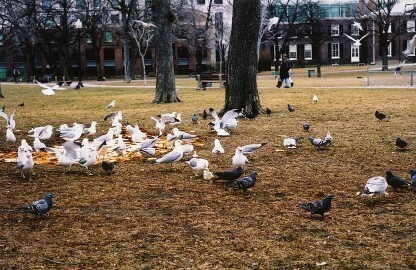 I took some heels of bread, crumbled them up and threw them on the toast pigeon, which ignited the whole crowd of birds. They tussled, pecked, swallowed and fought over it, and in less than 45 minutes the whole thing was devoured. The cops got there just as I was leaving, looking for the person feeding the birds piles of toast about whom they had received some complaints.